In my last blog, I analyzed how New Jersey shelters can save the cats coming into their facilities. 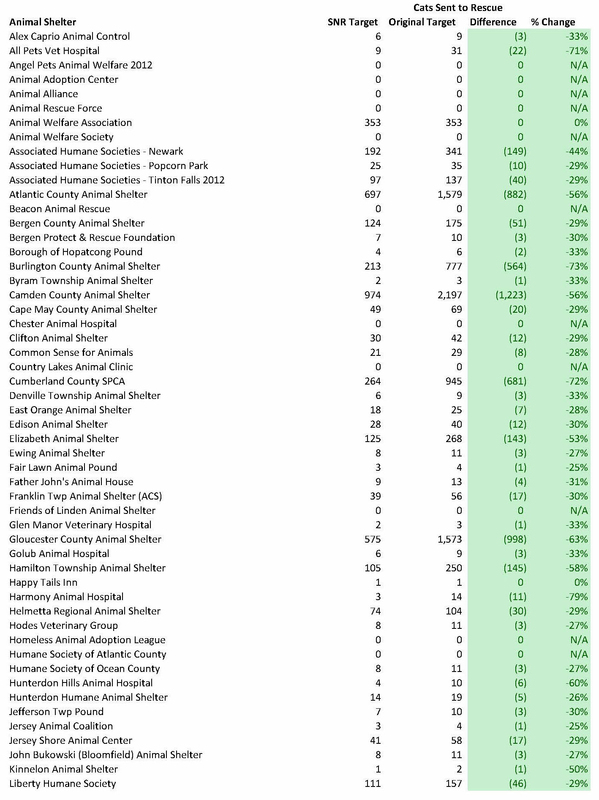 How would these results change if all New Jersey animal control shelters implemented large scale shelter-neuter-return (“SNR”) programs? Could these programs save municipalities money? What would be the potential lifesaving impact in New Jersey and beyond? 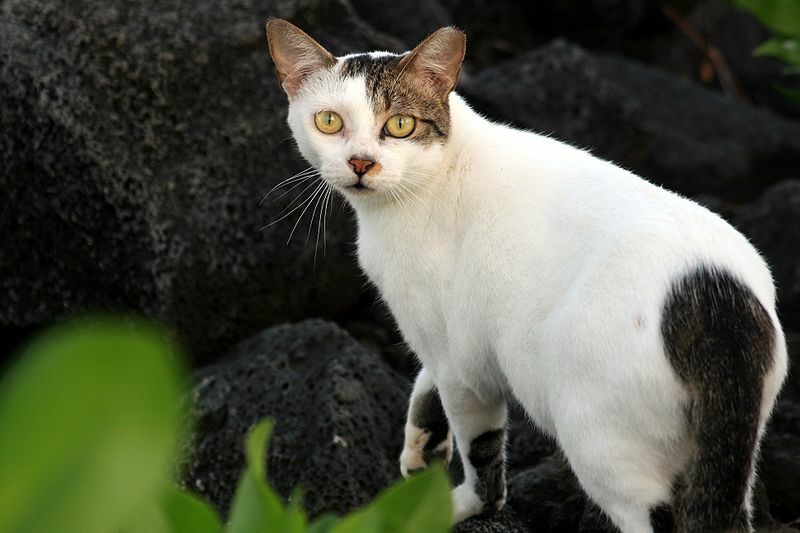 San Jose, California has offered a low cost spay-neuter program for owned and feral cats since 1994. Under the program, people use a voucher to get any owned or feral cat spayed/neutered, vaccinated, and microchipped for $25. In other words, the city practiced a traditional subsidized trap-neuter-return (“TNR”) program. The public trapped cats, brought them to clinics for spay/neuter surgery, and subsequently released the cats back to their habitats. Despite this program, the local animal control shelter, San Jose Animal Care and Services, still killed over 70% of its adult cats. San Jose Animal Care and Services implemented a SNR program several years ago. Based on a 2005 survey, 93% of owned cats were altered while just 5.5% of fed community cats were spayed/neutered. As a result of these findings, the city implemented a SNR program to better target the community cat population that continued to breed. Healthy feral and some fearful cats were impounded by the shelter, altered, vaccinated, microchipped, ear tipped for identification purposes and returned to the location where these cats were found. Shelter personnel impounded the cats, performed the veterinary work, and volunteers returned the cats to their habitats. Friendly, shy and some fearful cats did not enter the SNR program (i.e. shy and and fearful cats were sent to rescue or rehabilitated by the shelter). San Jose Animal Care and Services’ SNR program drastically reduced the facility’s cat intake and killing after starting this initiative. The scientific journal, PeerJ, published a study that documented a decrease in San Jose Animal Care and Services’ cat intake of 29% over the four year study. Additionally, the shelter’s cat kill rate dropped from over 70% to 23% in four years. Furthermore, dead cats found on the streets decreased by 20% over the period presumably due to a smaller cat population resulting from the SNR program. Additionally, the number of cats euthanized for Upper Respiratory Infections (“URI”) at the shelter decreased by 99% over the four year study. Thus, the SNR program significantly reduced cat intake, cat killing and the outdoor cat population. In order estimate the impacts from implementing similar SNR programs in New Jersey, I used my cat Life Saving Model. As discussed in more detail in my prior blog on how New Jersey animal shelters are performing with their cats, the Life Saving Model computes each shelter’s targeted number of animal outcomes, such as euthanasia, animals sent to rescue, adoptions, and animals rescued from other shelters, based on each facility’s reported capacity and past cat intake. 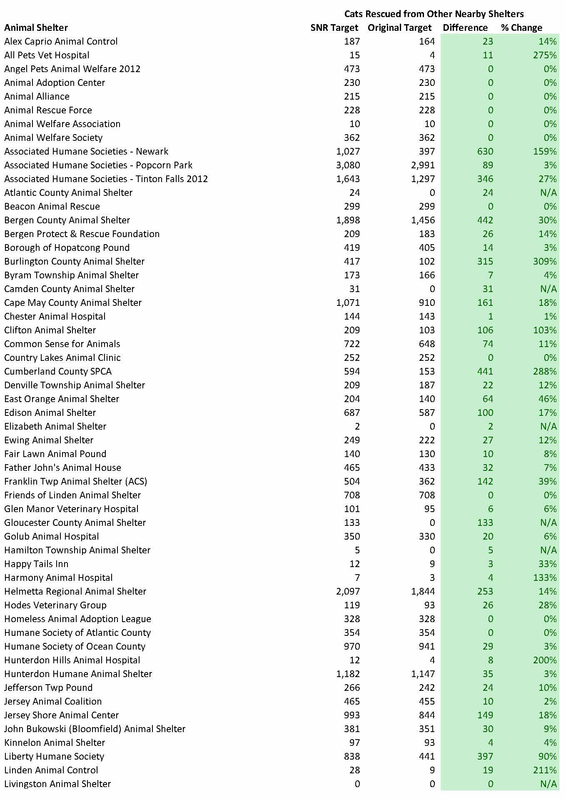 To estimate the impact of a well-run SNR program, I reduced each animal control shelter’s cat intake and owner reclaims by 29% (i.e. the decrease in San Jose Animal Care and Services cat intake). Cat intake and owner reclaims were not reduced at facilities without animal control contracts. The 29% decrease in cat intake assumption is reasonable given San Jose’s preexisting TNR program was likely as or more effective than most New Jersey programs (i.e. San Jose’s $25 low cost spay/neuter fee is lower than the amount New Jersey TNR caretakers typically pay for spay/neuter). 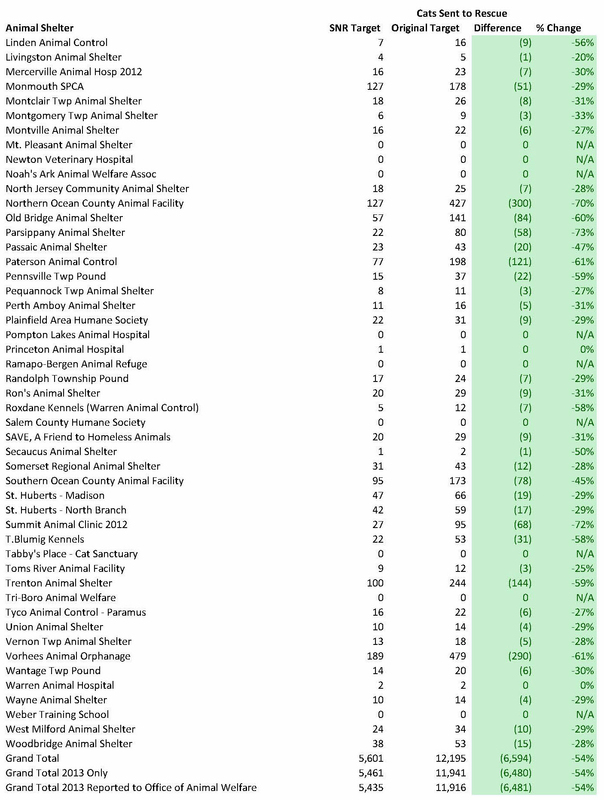 The table below compares the Life Saving Model’s targeted outcomes for the entire New Jersey shelter system based on the most recent number of cat impounds and projected cat intake after implementing a well-run SNR program. The targeted community or New Jersey cat intake decreased by 13,456 cats or 27%. Notably, the targeted number of New Jersey cats euthanized also decreased by 27% due to fewer cats coming into shelters. Additionally, the reduction in cat intake also significantly reduced the targeted number of cats sent to rescue by 6,594 cats or 54%. The extra capacity freed up from reduced New Jersey cat intake would allow shelters to rescue and adopt out at least another 13,777 more cats from out of state shelters or New Jersey’s streets. As a result, well-run SNR programs could significantly increase lifesaving in New Jersey. Thus, SNR significantly reduces the need for animal control shelters to rely on rescues and rescue oriented shelters. Thus, many animal control shelters could not only save their feral cats, but rescue many additional friendly cats as well. The Veterinary Journal published a study recently detailing the results of a large scale and targeted TNR program. The Alachua County, Florida animal control shelter increased the scale of its existing TNR program in one urban zip code where many of the shelter’s cats came from. Specifically, sterilizations increased from 4-10 cats/1,000 people to 57-64 cats/1,000 people in the target area while an adjacent area (i.e. the non-target area) maintained its sterilization rate of 8-12 cats/1,000 people. This high sterilization rate is important given altering a large percentage of the overall community cat population is critical to reducing the number of outdoor cats. Significant community outreach efforts were conducted, such as mailing information about the program to residents and businesses 5 times over the two year study, volunteers going door to door explaining the program, and TNR program administrators helping solve community cat nuisance problems. After 2 years, shelter intake decreased by 66% in the target area and only 12% in the adjacent non-target region. As a result, we can attribute the 54% (66%-12%) excess decrease in shelter intake as the net impact of this program. Urban New Jersey animal shelters may be able to reduce their cat intake even further based on the experience in Alachua County, Florida. While some of the decreased shelter cat intake in this one zip code relative to San Jose may have been due to Alachua County spaying/neutering and releasing friendly cats in addition to feral cats, the significantly higher sterilization rate of community cats (57-64 cats/1,000 people in Alachua County verses ~2.5 cats/1,000 residents in San Jose) no doubt played a significant role. In addition to not breeding, sterilized cats tend to roam and fight each other less resulting in fewer nuisance complaints. Fewer nuisance complaints leads to shelters impounding less cats. Certainly, a TNR program at this large of a scale is expensive, but running such a program in a small area, such as single zip code with a large intact cat population, is realistic. Thus, urban New Jersey animal shelters may be able to reduce their cat intake by even more than the tables above suggest. Large scale SNR and TNR programs are significantly more effective than traditional TNR programs. In the case of many TNR programs, a few volunteers capture cats for the program. Often, animal control shelters still impound feral cats outside of official colonies or just leave unaltered feral cats in the community. The SNR program in San Jose is more effective as ACOs capture feral cats who subsequently are spayed/neutered, vaccinated and returned to their outdoor homes. Similarly, the Alachua County TNR program used massive community outreach to sterilize and vaccinate more of the community’s cats. As a result, large scale SNR and TNR programs alter a greater percentage of the community cat population which ultimately results in reduced outdoor cat populations that are easier for people to live with. Municipalities will save significant amounts of money over the long term from implementing large scale SNR programs. Assuming 20% of the cats impounded at New Jersey shelters are feral, that works out to 1.1 cats per 1,000 New Jersey residents. Multiplying 1.1 feral cats by the estimated cost of $72 to perform SNR on a feral cat gives us a cost of $79.20 per 1,000 resident or 7.9 cents per person. Now, let’s assume the average New Jersey community pays $3 per capita for animal control and sheltering. 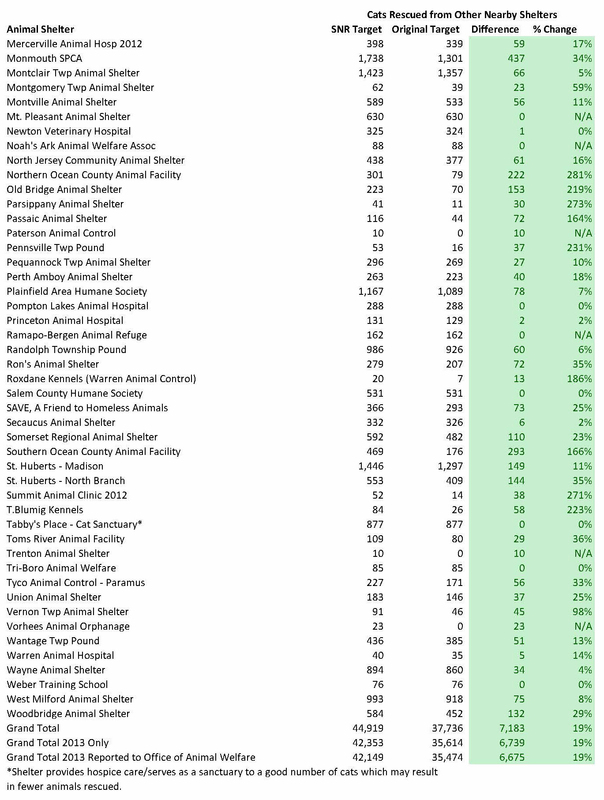 If we assume 50% of these costs are for animal control services and cats make up 2/3 of of these animal control calls (cats make up 66% of stray animals taken in by New Jersey shelters), then a 29% reduction in cat intake would result in a 28.7 cent per resident reduction in animal control costs. The animal control savings of 28.7 cents per residents is nearly four times greater than the 7.9 cent cost to run a SNR program. Furthermore, Maddie’s Fund’s Financial Management Tool estimates it costs around $40 to provide care to adult feral cats/kittens and kill them after the 7 day hold period. Based on New Jersey animal shelters taking in roughly 5.5 cats per 1,000 residents on average, the 29% reduction in cat intake would result in cat sheltering cost savings of 6.4 cents/resident. In other words, taxpayers would save a net 27.2 cents per resident as a result of implementing San Jose’s SNR program. These cost savings exclude likely lower sheltering costs relating to less disease from lower cat intake and increased donations/volunteer services due to lower kill rates. Thus, implementing SNR is a no-brainer from a taxpayer perspective. SNR also reduces nuisance complaints in the community. Smaller community cat populations are less likely to cause problems. Additionally, altered cats are far less likely to roam long distances in search of mates, and don’t get into loud fights over mating or territory which bother people. Furthermore, the reduction in shelter intake will allow ACOs to respond more quickly to animal control calls for nuisance complaints. Thus, SNR would result in fewer complaints about community cats to local officials over the long-term. SNR programs are growing in popularity. Unsurprisingly, several other animal control shelters near San Jose also implemented similar SNR programs and experienced similar reductions in cat intake. Clearly, nearby communities are incentivized or pressured to do better when their neighbors do great things. Furthermore, similar successful programs were implemented in Los Angeles, California, Albuquerque, New Mexico, San Antonio, Texas, and the Atlanta, Georgia area. In Albuquerque, cat intake and killing decreased by 39% and 86% after just two years. Thus, large scale and targeted SNR and TNR programs are a major innovation in animal welfare. Shelters and municipalities need to get behind SNR. SNR will clearly save the lives of countless feral cats, but will also indirectly save many more cats through increased space opening up at shelters and a reduction in disease outbreaks. It is time shelter leaders, the Animal Welfare Federation of New Jersey, and of course the public come together and demand these programs be put into place. We have the evidence and the argument behind us. Now is the time to fight for what is right.